The Lexus IS is the sportiest offering in the carmaker’s sedan lineup. 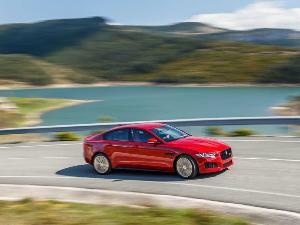 The entry-luxury sport sedan is available with a choice of rear- or all-wheel drive and goes head to head in its segment against established sporty four-doors including the BMW 3 Series, Audi A4, Mercedes-Benz C-Class, Infiniti Q50, and Acura TLX, plus newcomers such as the Kia Stinger and Genesis G70. The Lexus IS is the second-best-selling sedan from Toyota’s luxury brand, appealing to a younger demographic than the top-selling but more conservatively styled ES. There are several trims within the 2019 Lexus IS lineup: IS 300 ($39,435), IS 300 w/all-wheel-drive ($41,885), IS 350 ($43,155), and the all-wheel-drive IS 350 ($45,220), including the $1,025 destination charge. The F Sport trim adds about $2,000 to $3,000 depending on the model. This is one of the few Lexus models without a hybrid variant. 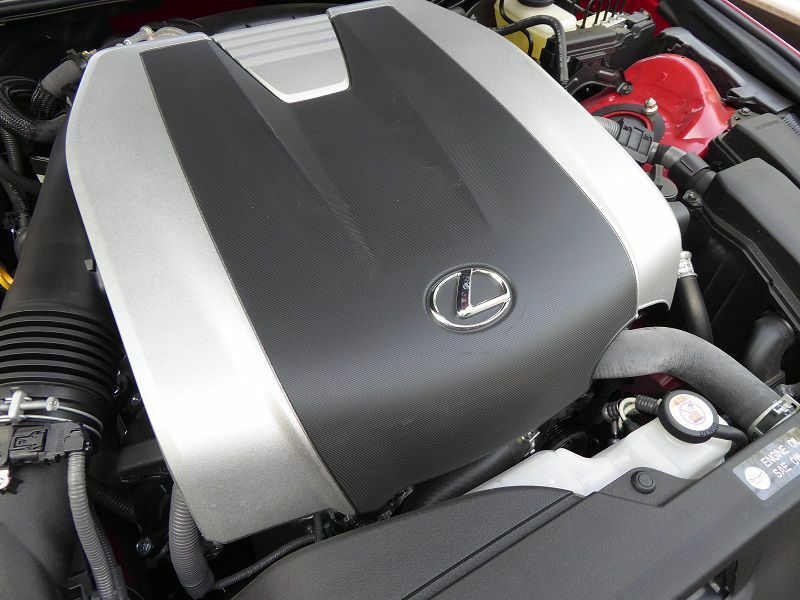 There are three engine choices in the Lexus IS lineup. 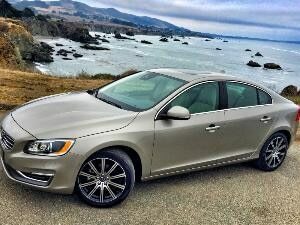 The base IS 300 rear-drive model comes with turbocharged 2.0-liter four-cylinder with 241 horsepower, 258 lb-ft of torque, and an eight-speed automatic transmission with paddle shifters. Arguably, it’s the least sporty IS, with seven-second 0-60-mph performance, and the least premium due to a four-cylinder soundtrack, but 2019 models enjoy upgraded throttle response and less turbo lag. It's also the lineup's fuel economy champ with an estimated 21 mpg city/30 mpg highway. All-wheel-drive IS 300 models upgrade to a sonorous 3.5-liter V6 packing 260 hp and 236 lb-ft of torque capable of snappy six-second 0-60 sprints. EPA fuel economy estimates drop to 19 city/26 highway. 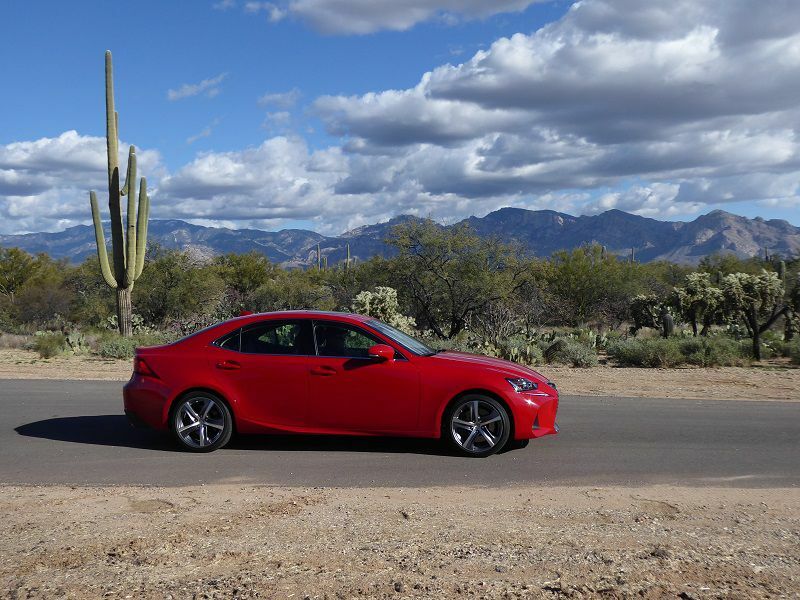 The AWD IS 300 is teamed with a six-speed automatic. The IS 350 is also powered by the 3.5-liter V6, but its version has a much livelier 311 hp and 277 lb-ft of torque, capable of runs to 60 mph in the mid-five-second range. RWD IS 350s get the eight-speed automatic while AWD versions use the six-speed. Despite its power, the IS 350's fuel economy is respectable at 20 mpg city/28 mpg highway with rear-drive and 19 mpg city/26 mpg highway with AWD. All IS models require premium fuel. 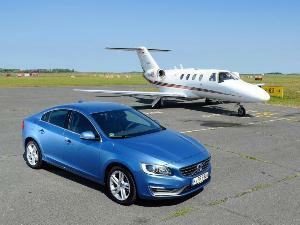 Both IS 300 and IS 350 models are available with all-wheel drive. Although rear-drive IS models can get by just fine in the southern and southwestern parts of the U.S., all-wheel drive gives IS drivers who experience snowy, icy winter weather added confidence on the road. The electronically controlled AWD system is constantly varying drive torque distribution front-to-rear to help maintain optimal traction. It works on dry roads as well as slippery ones. This typically runs at 30 percent front/70 percent rear on dry pavement and up to 50 percent front/50 percent rear in low-traction situations. The system works automatically, and there’s nothing the driver has to do except step over the hump next to the console where the driveshaft to the front axle comes out of the transmission. It doesn’t interfere with driving and is easy to live with, considering the real AWD traction advantages. 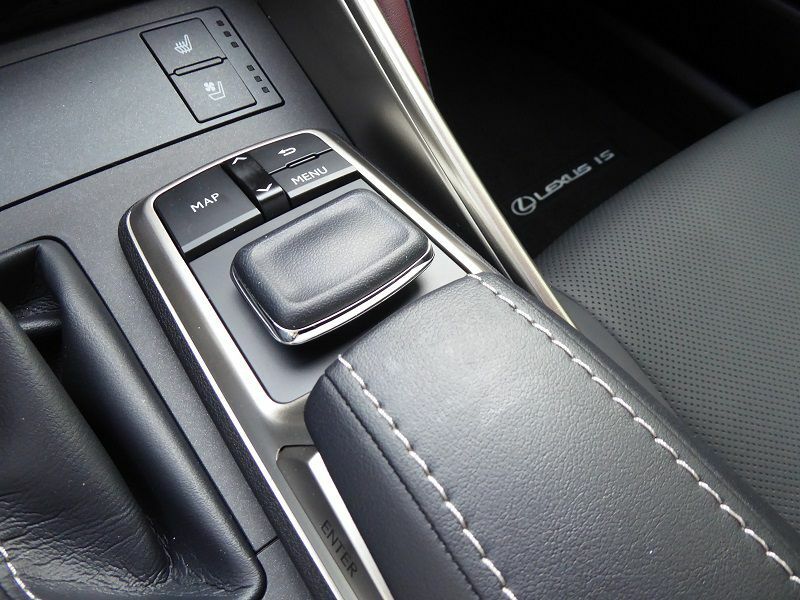 The Lexus IS has selectable drive modes that are operated by a switch on the console. The Eco setting delivers a more gradual throttle response and earlier transmission upshifts while the Sport setting gives slightly crisper throttle response and stays in the lower gears longer. 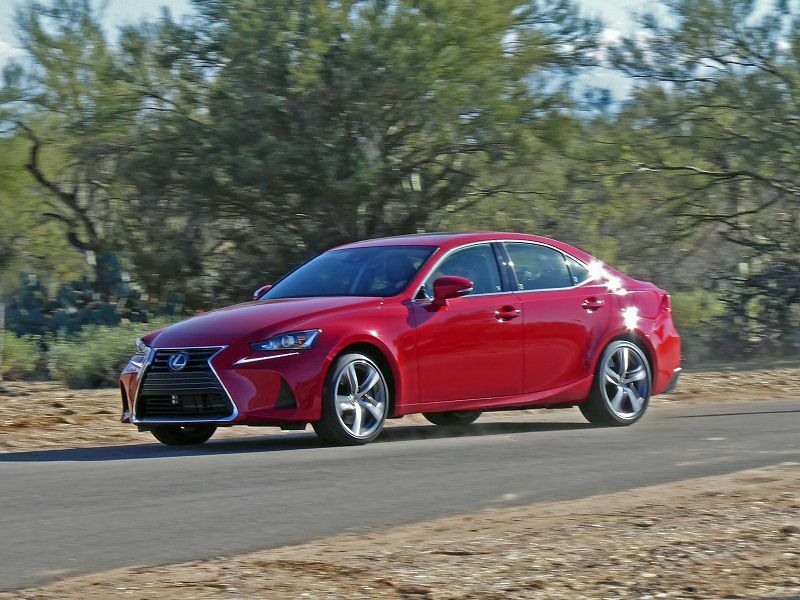 With the 260-hp 3.5-liter V6 in the IS 300 AWD model, the different settings deliver subtle adjustments, so drivers won’t notice a drastic difference between them. Snow mode, however, is notable in that the transmission starts out from rest in second gear to help avoid wheelspin. More differentiation is available with the optional F Sport package, which offers Sport S and S+ modes and adaptive variable shock damping. 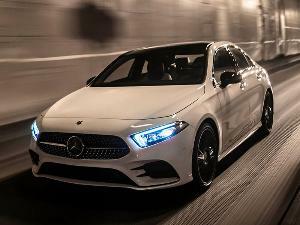 The entry-luxury sport sedans that compete with the Lexus IS — such as the BMW 3 Series, Audi A4, and Mercedes-Benz C-Class — set the bar for performance and luxury fitments in the class. That said, the IS 300 and IS 350 can more than hold their own in the segment with a compelling blend of premium fit and finish, crisp design, and fun-to-drive ride and handling. The Lexus IS is a driver’s car first and foremost. Its electric-assist rack-and-pinion steering is direct and nicely weighted, generously sized four-wheel disc brakes deliver pinpoint response, and shock damping keeps the IS balanced and composed over a wide range of surfaces. Handsome five-spoke alloy wheels (17 inches on the IS 300 and 18 inches on the IS 350 and F Sport) do a great job of filling out the wheel wells. As you’d expect of a Lexus, the cabin is hushed and body integrity solid. For even more traction at the edge, an optional Torsen limited-slip rear differential is available on the rear-wheel-drive IS 350. The F Sport package brings slightly stiffer suspension tuning, and rear-drive versions are available with summer performance tires as well as adaptive variable damping. 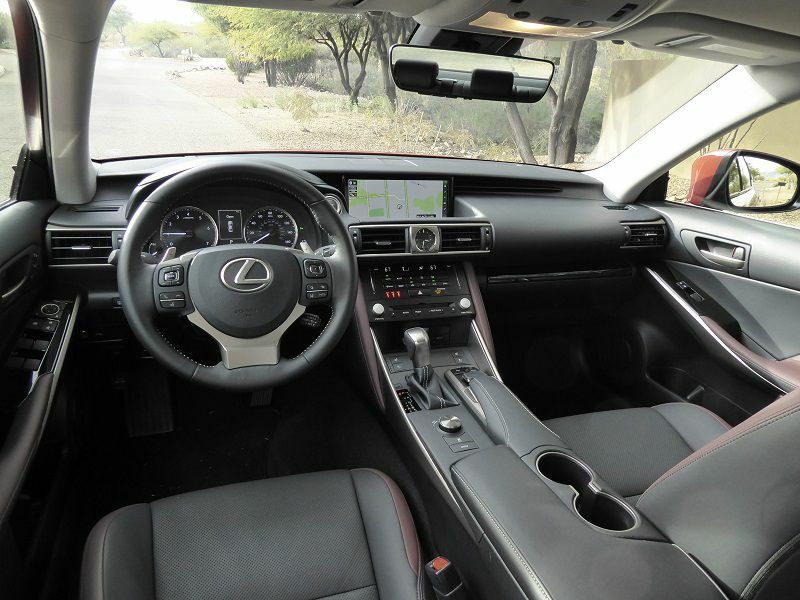 The cabin of the Lexus IS is upscale without being glitzy or gimmicky. Colors and shapes complement one another. Materials exude a durable-goods, quality feel. Controls are straightforward, instruments pleasant, and the Optitron analog dials are easy to read. A standard power moonroof adds a touch of class, and dual-zone automatic climate control, push-button start, and a HomeLink programmable garage door opener make life in the IS a little easier. While the IS sedan is suitable for adult habitation with more-than-decent front headroom and legroom, there isn’t a lot of storage space. Pockets in the doors are handy, but the smallish glovebox is overwhelmed by the huge owner’s manual (you're best off putting that in the trunk), and the console doesn’t have a lot of stash space for trip detritus. There is no wireless phone charger available, either. 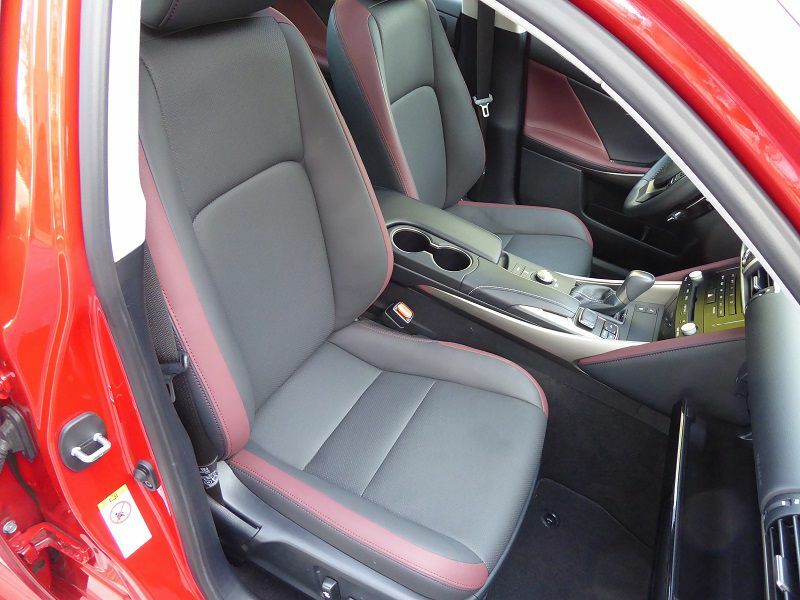 Keeping a firm grip on your derriere and lower torso are the IS front bucket seats. These are comfortable enough to take a day-long trip in, yet they offer the kind of side-bolster lateral support for thighs and lower back to keep you planted when the road turns twisty. Animal-hide lovers out there take note: The only seat coverings available are the standard Lexus Nuluxe faux-leather ones. That said, Nuluxe feels like a premium material that doesn’t require an animal to give up its skin. The front buckets are available with heat and ventilation, but no massaging function is offered. Standard in the Lexus IS is an eight-speaker AM/FM/MP3/WMA stereo with digital signal processing, Bluetooth audio streaming, SiriusXM, HD radio and a 7-inch display screen with traditional knobs and buttons. 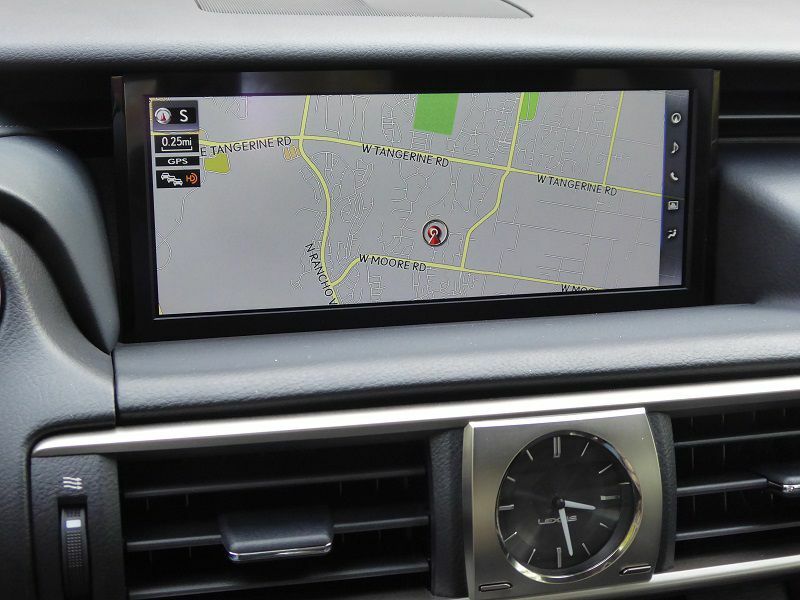 It even offers Scout GPS Link, which delivers a basic navigation system working with your phone. But to get the full Lexus experience, you’ll want to try the optional navigation package, which includes a much larger 10.3-inch horizontal display divided into climate, audio, and navigation sections; speed limit signs; predictive traffic and weather displays; voice control; and more. Plus, the sensational 17-speaker, 835-watt Mark Levinson surround-sound audio system is onboard with the nav system for full, rich, crystal-clear audio fidelity. Not onboard, however, is Apple CarPlay or Android Auto phone compatibility for apps. And there’s no 4G LTE Wi-Fi — yet. Lexus is starting to roll out these features on other models. Because the infotainment display screen is beyond the reach of a seated driver, the 10.3-inch screen does not have touchscreen functionality. Instead, Lexus engineered a remote touch interface to allow the driver to access various functions and programs. The arrangement includes a mouse-like toggle-and-click gimballed button; handy “back," up/down arrow, map, and menu buttons; and a console-mounted pad to support and steady your wrist while you operate the remote touch interface while rolling down the highway. The system takes some practice to master. 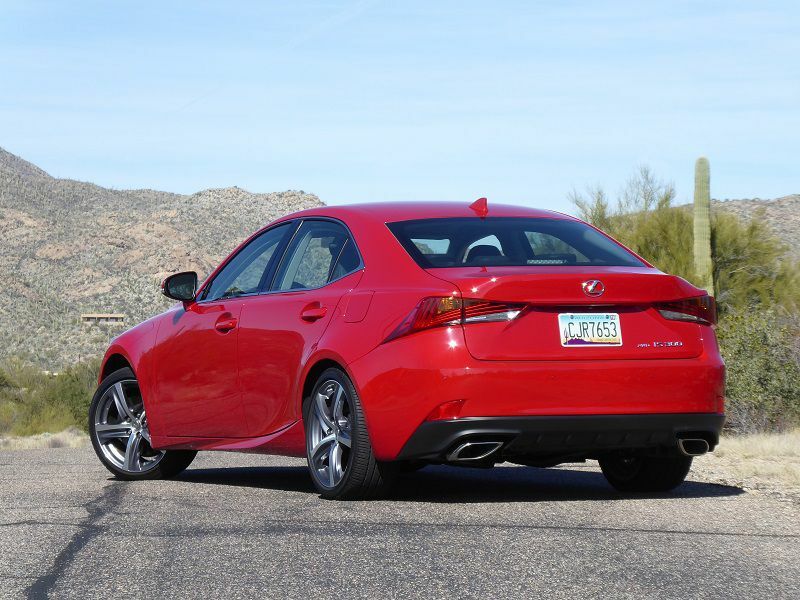 The Lexus IS is a tidy sport sedan that focuses on the driver. So while the back seat can theoretically hold three people, two would be more comfortable, and all back-seat patrons will benefit from the front-seat occupants moving forward their chairs a few notches. 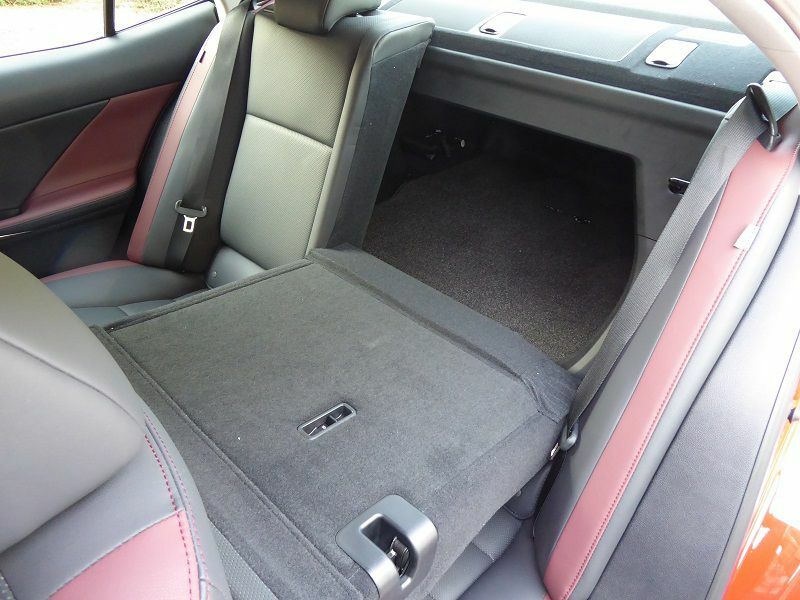 The rear seatbacks are split 60/40 and fold down, affording larger or longer items to be transported in the IS’s abbreviated 10.1-cubic-foot trunk. 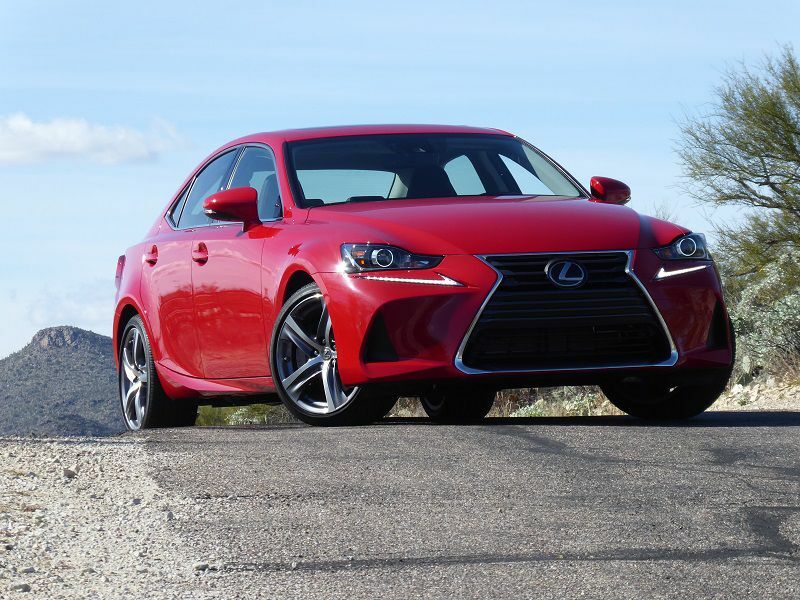 The 2019 Lexus IS 300 remains one of the best-looking entry-lux sport sedans on the market. 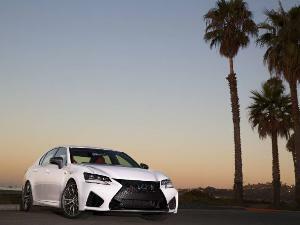 The trademark Lexus spindle-shaped grille, outsized on some Lexus models, seems harmoniously proportioned on the IS. And the car’s angular, flowing lines, short overhangs, and wasp-waisted body — tightly drawn over tastefully bulging wheel wells — suggest a dynamic character that is successfully borne out in the driving experience. Keeping it safe is a standard suite of systems that includes 10 airbags, high-speed adaptive cruise control, a pre-collision system, a lane-departure warning with steering assist, a backup camera, and intelligent high-beam control. 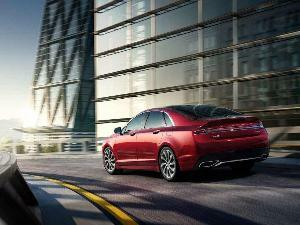 Blind-spot monitoring, a rear cross-traffic alert, and intuitive parking assist are available as options.